Mar 1, 2014; Phoenix, AZ, USA; Texas Rangers starting pitcher Martin Perez (33) throws during the first inning against the Oakland Athletics at Phoenix Municipal Stadium. PHOENIX (AP) — Oakland designated hitter Yoenis Cespedes drove in a run with a sacrifice fly against Martin Perez as the Athletics and Texas Rangers played to a 2-all tie Saturday. The game was stopped after nine innings. Billy Burns, who replaced Coco Crisp in the starting lineup just before gametime, had two hits, stole two bases and recorded a pair of outfield assists for the A’s. He also scored both runs, tying the game on an infield error. Engel Beltre had two hits for the Rangers. Jurickson Profar and Jared Hoying each drove in runs. Perez allowed a run on one hit in his two innings. He walked two and struck out one. A’s starter Sonny Gray also went two innings, giving up a pair of hits, walking two and striking out two. Rangers outfielder Michael Choice, who made his major league debut with the A’s last September, doubled against Gray. "I threw him a fastball," Gray said. "He was just another hitter to me." Choice said before the game he would try not to laugh when he came up to face his former teammate. "It was fun to see a lot of guys I was familiar with," he said. "I wanted to have fun with it. I didn’t want it to be a tense environment." Burns threw out Beltre at third in the first inning, helping avoid a Texas rally. He threw out Hoying at the plate in the seventh after the Rangers had taken a 2-1 lead. 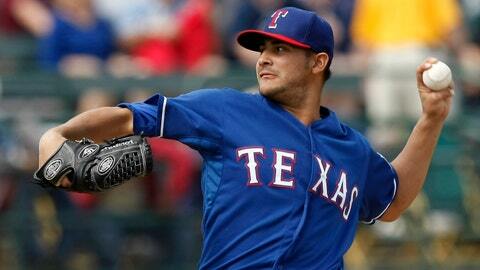 Rangers: Perez was happy about his first outing, though he’ll be working on his sinker. "It’s been a long time since I faced hitters," he said. "The most important thing for me was to keep the ball down. The sinker was too big, it moved back over the plate." Perez became the first Texas rookie to win five games in a month last August. "I feel better because of the experience," Perez said. "But I have to keep getting ready for the season and work more on that pitch." Athletics: Gray also made an impression in the majors last season, going 5-3 with a 2.67 ERA in 12 games, 10 starts. He also started twice in the ALDS against the Detroit Tigers. "I feel like I have to make better pitches with two strikes," Gray said. "I was making too good of a pitch with two strikes. That will come in time." Lefty Scott Kazmir will throw to hitters on a back diamond Sunday instead of facing the Los Angeles Angels. Jesse Chavez will make his second start of the spring instead. Rangers: Shortstop Elvis Andrus (right flexor tendinitis in his forearm) will take it easy for a few days, outfielder Leonys Martin (back tightness) remains day to day but has been taking batting practice, and lefty Rafael Perez (right hamstring injury) is schedule to throw live batting practice on Sunday. Athletics: Right-hander Ryan Cook (shoulder) and lefty Eric O’Flaherty (Tommy John surgery) each continue progressing in their respective throwing programs. Cook will throw once more on flat ground before taking a bullpen session. O’Flaherty will stick to flat ground for the time being. Crisp was a late scratch, but there’s nothing wrong with him. He said manager Bob Melvin decided to give him the day off because of a heavy rain that fell an hour before game time and lasted 20 minutes. A’s infielder Nick Punto was in Saturday’s starting lineup as a shortstop. He started Friday’s game at second base. That’s nothing new for Punto, who has played seven positions in the major leagues. He’s played at least 320 games at third, second and short and has a handful of games at first base, too. "I just show up and look at the lineup every day," said Punto, who added he doesn’t need any lead time knowing where he’ll play. "I’ve been doing it so long it doesn’t bother me at all. Just put me in the lineup, I like to see my name there." He has an up-and-coming utility star in his midst, as the recently-acquired Jake Elmore has played all nine positions in the majors. Michael Choice has hit safely in each of his first three games but for him, it’s about getting ready for the year ahead. "I’m focused in getting ready for the season," he said. "I’m here to help this team win and I’m letting all the hard work I put in the morning play out. Instead of trying to do too much I want to get into the flow of the game." Choice explained he would work on a short stroke in the morning and find himself swinging big in the game. "I have to focus on the things I’ve worked on," Choice said. "Staying in a routine has been helpful."